Popovers make perfect little fruit cups. They are light and fluffy, and oh-so-easy. If you have leftovers you can rename them "Yorkshire Pudding" and serve them with a roast or stew. This recipe is adapted from my ancient edition of the Five Roses Guide to Good Cooking using avocado oil* and an extra egg per dozen. Substituting wheat flour for the white will still taste good but will not puff up as high. Mix the flour and salt together in a bowl. In a separate bowl, beat the eggs with a whisk. Heat the milk, either in the microwave or on the stovetop, to just below boiling. A little at a time, whisk it into the eggs. Whisk in the dry ingredients and beat until smooth. Once the oven is hot, pour a tiny amount of avocado oil into each part of the muffin pan. Swirl it around to make sure it is enough to cover the bottom, then pop the pan into the oven for five minutes. Remove the hot muffin pan from the oven, and carefully fill each cup with batter. Bake for fifteen minutes at 450F, then turn the heat down to 350F. Bake for another ten to fifteen minutes, until the popovers puff up, then turn off the heat. Leave the pan in the oven for another ten minutes with the heat off. 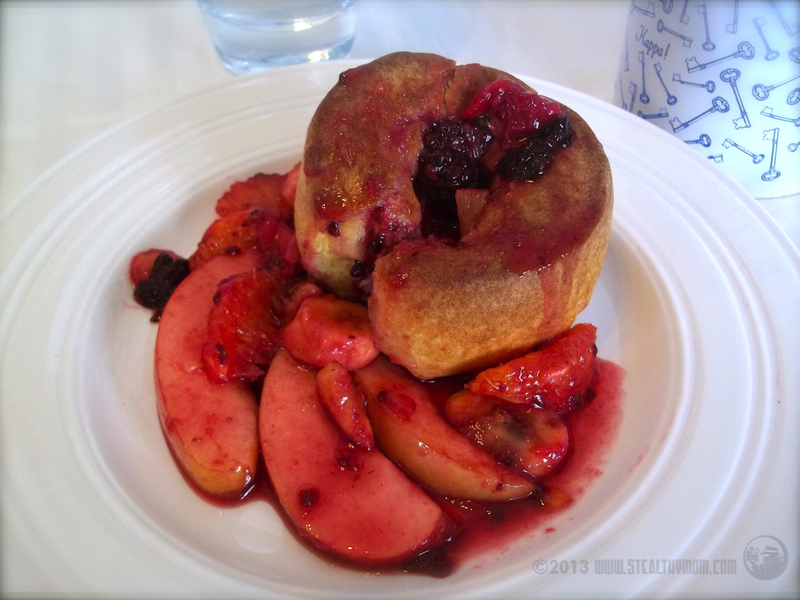 Serve with fresh fruit, butter and honey, or as Yorkshire Pudding. Mix the fruit and syrup in a bowl, at least half an hour prior to serving so the fruit juices and syrup mix together. I shared this post with Thriving on Thursdays and Full Plate Thursday. *The original recipe calls for vegetable oil, and was written long before most corn and canola oils were genetically modified. Lard and olive oil have too-low smoke points to be preheated in a high oven. Avocado oil is perfect and well worth seeking out before you make popovers. You only need a wee bit so the tiny bottle you will typically find at the health food store will last a long time. Oh this looks so good Stealthy. I'll definitely be doing this when things cool down over here. Thanks for linking up to Thriving on Thursdays. This Fruit Cup looks delicious! Your recipe is fabulous and thank you so much for sharing with Full Plate Thursday. Have a great weekend and come back soon! Your recipe is featured on Full Plate Thursday this week. Have a great week and enjoy your new Red Plate! Guest Book- You Know You Want to Sign It! Like us on Facebook for new recipes! Make Your Own String Cheese!